We first started building this email system in 2006 while working on the Casey, Strickland, Brown, Granholm, and Sebelius campaigns. In 2008, as a part of the DCCC Red-to-Blue "Values, Vets, Victory" program, it helped winning Democrats successfully connect with voters through shared values from Alabama to Oregon. In the decade since, it's powered our work on numerous advocacy campaigns in pursuit of the common good. With 110+ million ideologically diverse values voters in our system, we can communicate with large groups of voters in any state or CD in the country. 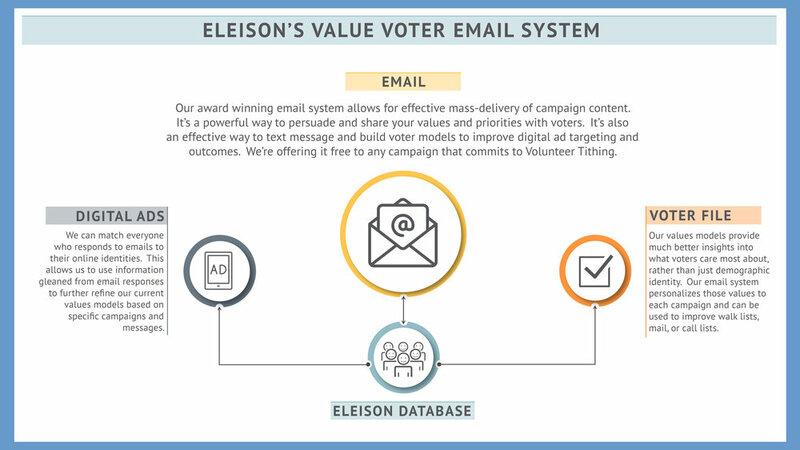 We're offering to send emails to our list on behalf of any campaign that commits to tithe volunteer time. In addition, we'll work with campaigns to craft authentic values-based messages that will be most likely to resonate with voters on our list.